The country's corporate titans have climate goals that are more ambitious than their government's, and see unified carbon pricing as key to combating global warming. Germany’s new “grand coalition” seems in no hurry to repair the country’s tarnished reputation on climate change, let alone take the lead in battling global warming. 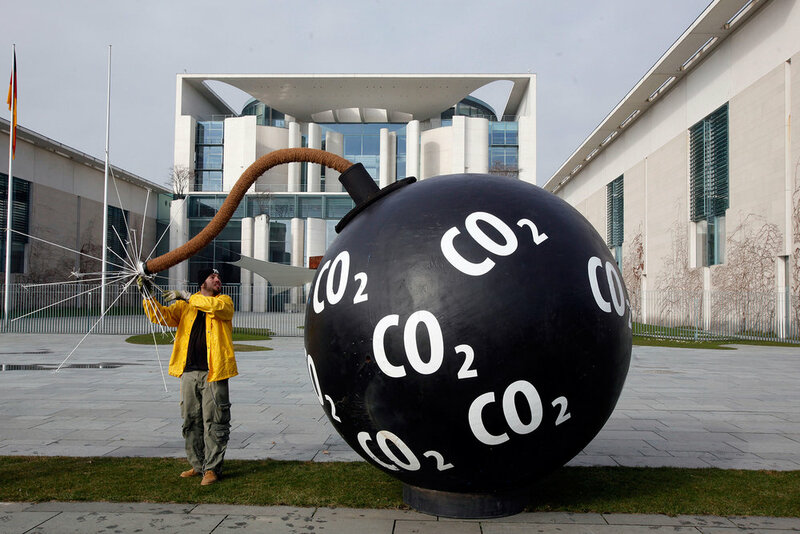 Critics say the 170-page coalition agreement, which was hammered out by Angela Merkel’s conservative Christian alliance and the center-left Social Democrats earlier this month, offered few policy clues about how to stop the earth from overheating. Instead of waiting for action at the top, big businesses are practically falling over themselves to cut emissions in line with the Greenhouse Gas Protocol (see list below). Sporting-goods maker Adidas says it has trimmed its own greenhouse gases by 21 percent in the last five years alone, and is working with suppliers to cut emissions throughout its supply chain. Detergent and glue maker Henkel aims to reduce its carbon footprint by 75 percent by 2030. Software giant SAP is going one step further, with plans to make its own operations climate-neutral by 2025. But firms’ internal measures can only go so far and the best way to battle climate change will be to use rewards and penalties, experts say. The bosses of Germany’s 30 largest companies, which make up the DAX stock market index, are overwhelmingly in favor of introducing a single, unified carbon pricing system that would embrace all sectors of the economy. At present, that pricing is limited to power generators and heavy industrial companies that trade emissions credits in London and Leipzig. Businesses complain that today’s carbon pricing is a maze of overlapping taxes, levies and subsidies, and should be replaced with a simpler, more transparent scheme. “The current system is too complex, punishes innovation and sends the wrong messages,” says Andreas Kuhlmann, head of the German Energy Agency, a renewable energy group. Carmaker Volkswagen says a single CO2 pricing scheme would act as a control model for achieving climate goals, allowing market mechanisms to reward climate-positive activities. Power generator E.ON, airline Lufthansa, Munich Re and Allianz and SAP are among the most vocal supporters of such a scheme. Deutsche Börse, the German stock-exchange operator, supports carbon pricing but says European emissions trading should be improved before unified pricing is introduced. Two years ago, Siemens joined the World Bank’s Carbon Pricing Leadership Coalition, an interest group campaigning for unified global carbon pricing. The company says pricing must reflect the true costs of emissions and should be high enough to promote a transition to low-carbon technology. But Bayer, the chemicals and pharma giant, argues that any change shouldn’t endanger competitiveness, as does Heidelberg Cement. To sum up: While Germany’s biggest companies have made great strides in cutting emissions, the sticky details of carbon pricing should take a long time to hash out. Older PostLow-carbon shipping: Will 2018 be the turning point?